Desire is what moves us and there is always something desirable just out of reach. My work is about reconciling my worldly desires with my deep longing for a connection with the divine. I have felt God’s presence throughout my life but as a child this experience was innate. I knew that God was within me and around me and that everything was just as it should be. As an adult I now realize that God did not move away from me but I left him behind as I placed my faith in people and things. My recent work is about my attempt to recapture my connection with the divine from this childlike perspective, when I practiced my own religion concocted from dogma, fables, myths and magic. 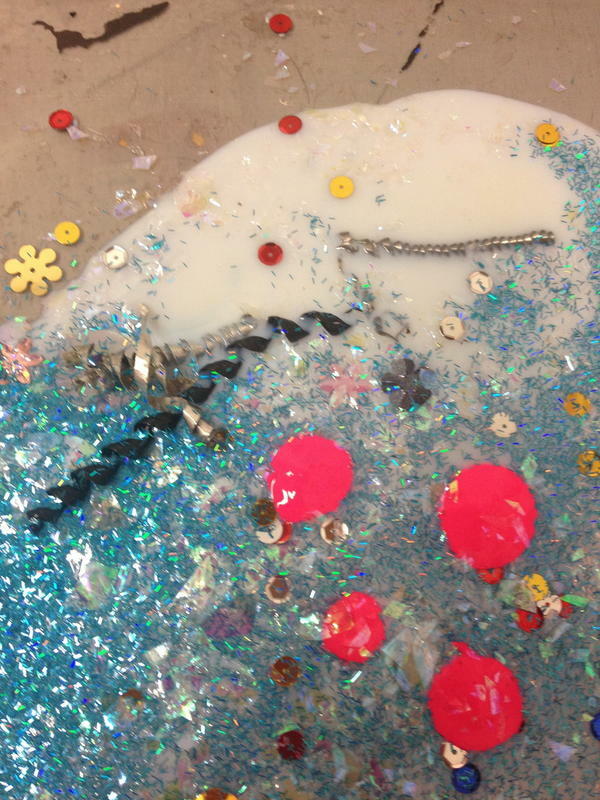 I often use playful materials such as glitter, sequins, and paints in various shades of pink to create work from this unsophisticated viewpoint. I allow myself to “play” in my studio trusting my intuition and even my materials, which I consider a spiritual practice in itself. I peel up Dream Catchers from puddles of medium and sparkly things. My sixteen-year-old self writes love letters to Arshile Gorky with gel pens and stickers. I paint quiet places in the midst of unruly shapes and lines on canvas after reading the words of Lao Tzu and Rumi.